Over the last few years, Rachel has been developing a range of naturally dyed trimming and threads in collaboration with BioDye India. The Botanica Tinctoria range offers designers of sustainable textiles and fashion a wide range of beautiful and fast colours. 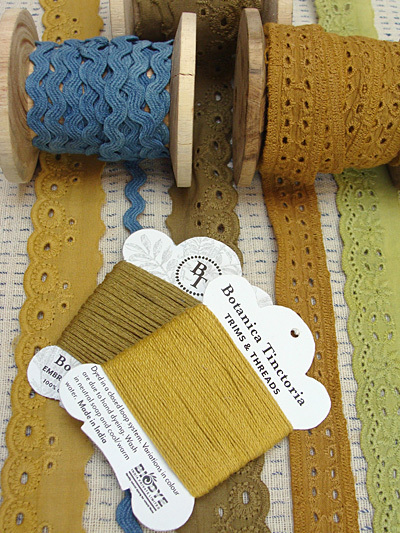 The carefully curated collection of trimming includes ribbons, tapes, broderie anglaise, hand crocheted lace and rick rack as well high quality cotton and Eri silk embroidery threads. The harmonious and luminous palette of 14 natural colours is sourced from traditional dye plants such as indigo and madder. Reviving historical practices and implementing current environmental ideas, both organic and conventional cotton materials are dyed with BioDye India in a closed loop process. BioDye uses dyes, mordants and auxiliaries that are environmentally safe and all waste materials are bio-degradable. In fact, waste products, including compost and irrigation-quality water, are used to grow dye and medicinal plants. If you would like to learn more about the project, see the Project Journal and to see the materials visit www.botanicatinctoria.com.